Mystical Scrapbooks will not allow me to copy the color challenge image, so here is a link.. 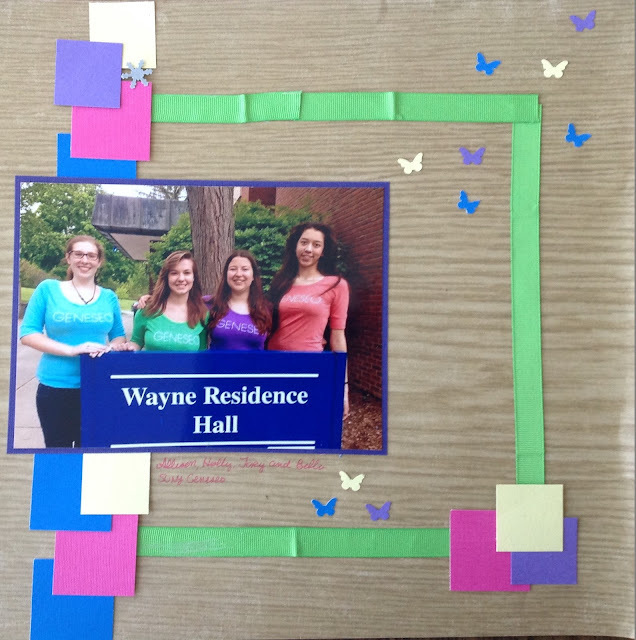 I used the bright navy, purple, pink and yellow in the form of solid paper, and the bright green in the ribbon. I was inspired by the bright pops of color against the wood of the trees and crates, so I used woodgrain brown paper as a background. My daughter is a freshman in college. She and her roomies all bought the same shirt in different colors for a wonderful photo op. Love this picture!! Such a sweet page - these girls sure do look happy. Thanks for joining in with us on Mystical. I love how you have used the colour of the girls T's in your layout!